I didn't know it was chili month. Have a terrific Tuesday. BWAHAHAHAHAHAHA! We don't have a dog, so we just blame Harry! Chili Month? Who would have thought? A Corgi?!? Gaahhh, so cute. 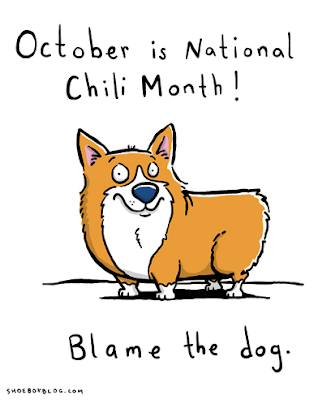 Happy Chili month! What did Faraday do? LOL. Gloman ALWAYS tries to blame it on ME? Can you believe it??? Sometimes the sound is so loud it blows my ears back. We don't have a dog, so I, as the littlest, get blamed!